A cell is a modular unit for generating life; it is also an isolating space for protection, reflection and for punishment. 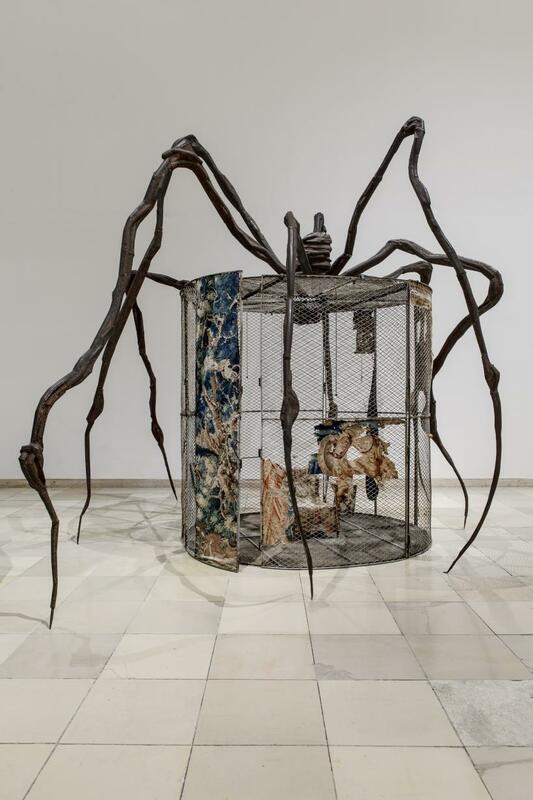 For Louise Bourgeois, the cell encapsulates much of what is at the core of life and of art-making. 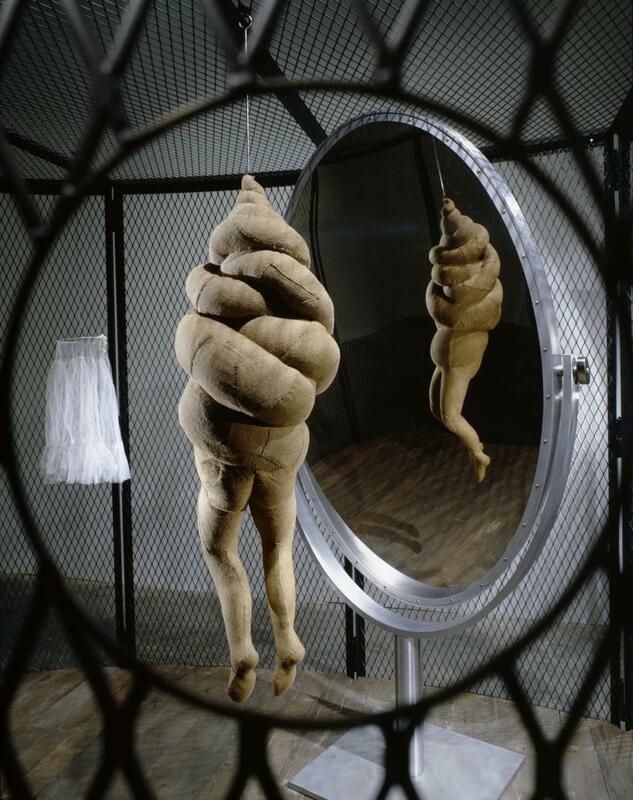 28 of Bourgeois’ sculptural series titled ‘Cells’, approximately half of those made by the artist between 1996 and 2008, form the backbone of her current exhibition at Guggenheim Bilbao. 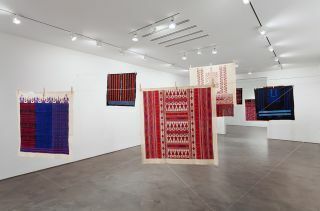 Comprised of free-standing mesh-walled, windowed, enclosed or partially enclosed structures, the works pull together found domestic and architectural materials with carved, stitched and cast objects. 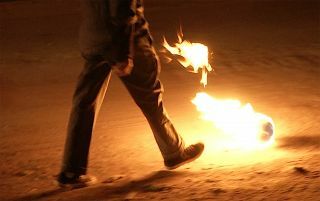 The resulting works are finely-tuned and probing enquiries into autobiographical emotion and experience. 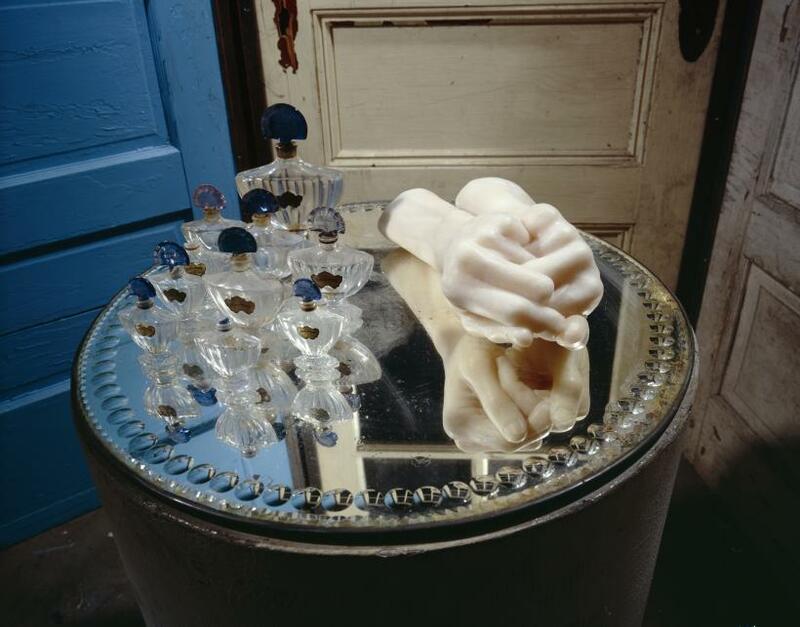 Take ‘Passage Dangereux’ (1997), a companion to the ‘Cells’. This large construction represents an interior (rite of) passage within a space very much like a series of tiny prison cells. 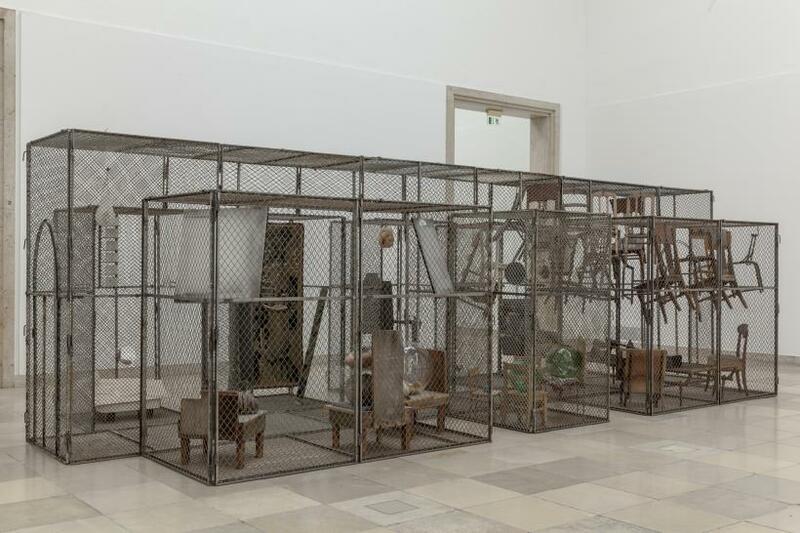 Originally designed to be walked through, the sculpture’s motifs include rabbit ears, an electric chair, bones and mirrors that chart a journey from birth to adolescence. The piece culminates in a gathering of suspended chairs that watch voyeuristically over two sets of feet lying upon a bed – a reference to her father’s well-known liaison with the artist’s au pair. One of Bourgeois’ bronze spiders, an oft-used symbol for her mother, lurks in the corner of the final space. The exhibition is filled with Bourgeois’ personal semiotics. The house, the spider, sewing thread, the rabbit, isolated heads, feet and hands are symbols that directly link to the pain, curiosities and anxieties of her childhood and her internal world. ‘Cell VII’ (1998) includes many of these references. 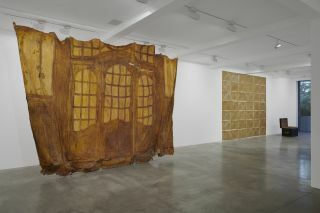 Cotton undergarments are hung up in the interior of a claustrophobic cell made from heavy, old doors, alongside animal bones, an amorphous ball of wax and numerous spun threads. 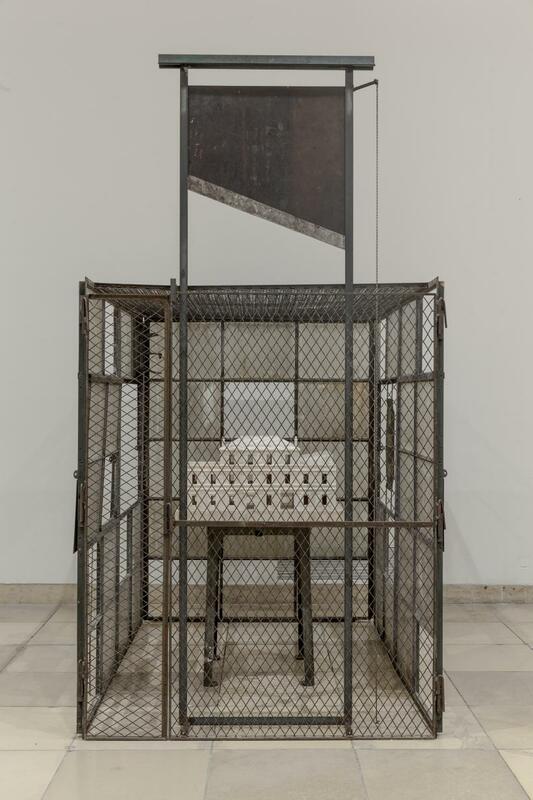 ‘Cell (Choisy)’ (1990-3) meanwhile, contains a marble replica of Bourgeois’ childhood home, from which her parents ran their tapestry repair business, suspended within a cage and beneath a guillotine. Jerry Gorovoy, Bourgeois’ assistant and friend for 30 years until her death aged 98 in 2010, has played a key role in the exhibition. Gorovoy noted that for Bourgeois, her “work was more her than her own physical existence,” emphasising the ways that the sculptures were emotional outlets for the artist; diary-like expressions of things she was unable to adequately verbalise. Gorovoy is keen to steer questions away from psychoanalysis, feminism and from politics, instead referring to the work at hand. “The work speaks for itself,” he says. It is significant too that Bourgeois was largely unconcerned with audiences, exhibitions and galleries. Her work was not made with these outcomes in mind. ‘Cell (The last climb)’ (2008) occupies the penultimate room. 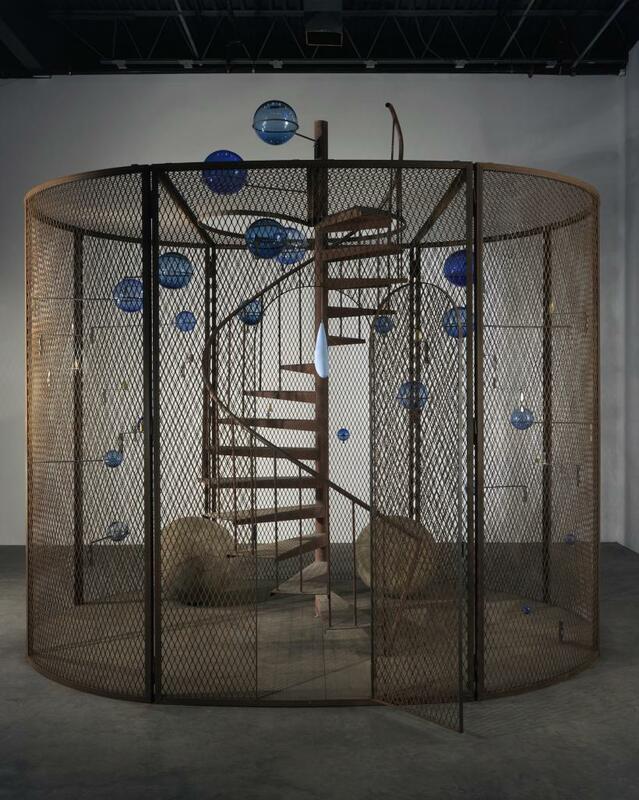 It comprises a metal cage or aviary that holds glass orbs and a rusted spiral staircase that leads outwards; perhaps to the sky. Throughout the exhibition, the sculptures on display are meticulously planned and tightly executed. Bourgeois’ control over every aspect of the work is explicit. Near to this sculpture, however, are a series of six multi-panelled drawings titled ‘I Give Everything Away’ (2010). Fleshy in their thick daubs of paint, smudges and pencil scribbles, the drawings, as with other maquettes, paintings and smaller works, serve to contextualise the ‘Cells’. More than this, these drawings offer a glimpse into an even more expressive, gestural and visceral side to the artist’s work. These drawings, featuring the inscriptions, “I distance myself away from myself … From what I love most,” were completed shortly before her death. Rather than symbols for emotional experiences, here it is pure emotion – it is Bourgeois herself, who is laid bare. Bourgeois needed to make her work, says Gorovoy. It was at the heart in her very being, even at the end of life.